As you are aware Oppo has recently partnered with Tencent Games, the world’s largest gaming company for India’s biggest eSports Championship, ‘Player Unknown’s Battlegrounds MOBILE Campus Championship 2018’ in India. After receiving multiple entries and a total of 10,000 teams from over 2000 colleges, a month-long tournament finally culminated on October 21st at the first ever PUBG themed Oppo store in Bangalore. Today, the winners were honored with a prize money of INR 50 Lakhs. 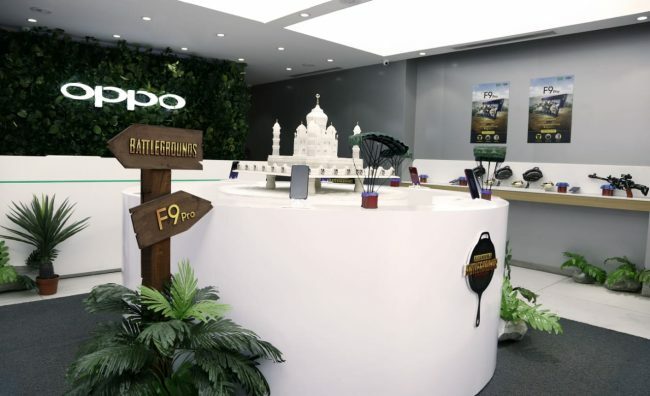 Keeping in mind the growing trend of PUBG, the Oppo brand showroom has been designed like the real battleground. Along with the combat feel, consumers can now move away from the virtual world and step into the real word of PUBG by experiencing the adrenaline of the game in the store with the new Oppo F9 Pro as stated by the company in its press statement. Oppo F9 Pro is an ideal smartphone for gaming as it comes with 6.3-inch bezel-less, 1080*2340 resolution display and a super-high screen-to-body ratio of 90.8% waterdrop screen. After intense rounds and some amazing performances leading to ‘’winner winner chicken dinner’’, a total of 20 teams competed at the grand finale and the ultimate winner was awarded a prize money of INR 50 lakhs.